You will need basic knowledge of React Native. You will need two devices to test the app - this tutorial uses Expo for this purpose. In this tutorial, we’ll build a simple chat app with React Native and Chatkit. 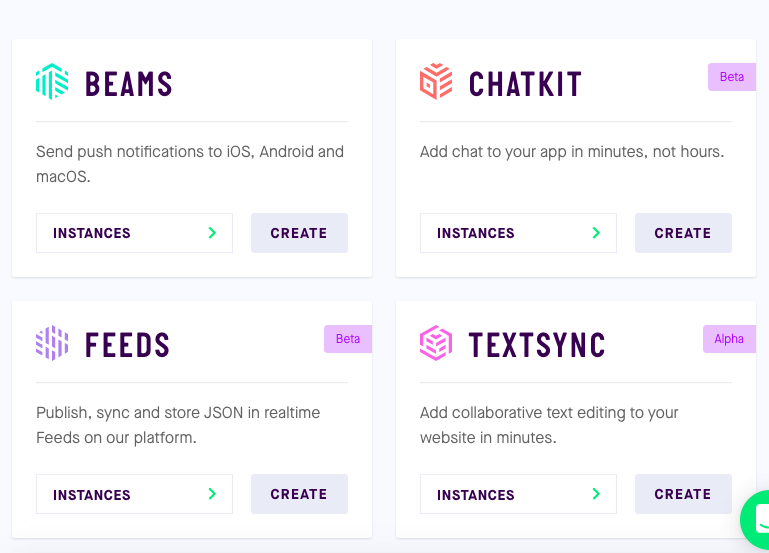 Chatkit is a Pusher service that allows Android, Swift, React Native, and web developers to easily implement various chat features such as message storage, typing indicators, and online presence. Basic knowledge of React Native is required in order to follow along. We’ll be specifically using Expo to develop the app as it makes it easier to test it on a device. This is specifically useful since we need at least two devices in order to fully test the app. If your machine is not that powerful, it will basically struggle if you run two simulator instances so running it on a device will offset some of that processing power and memory consumption. If you already have the React Native development environment set up, you can use it as well as we won’t be using any Expo-specific components. Lastly, you need the Expo client app for either Android or iOS. This allows us to easily run the app on our device. View the users who are currently online. Typing indicator when the user you’re chatting with is currently typing something. You can view the source code of the app in this GitHub repo. Take note of the credentials as we will be needing them later. Note that this is only useful for testing purposes, don’t use Pusher’s servers for production apps. The starter branch contains all the files that we will be using for the project, except for the server-related files. For now, they only contain minimal UI and all of the styles. We will be updating these files as we move along. 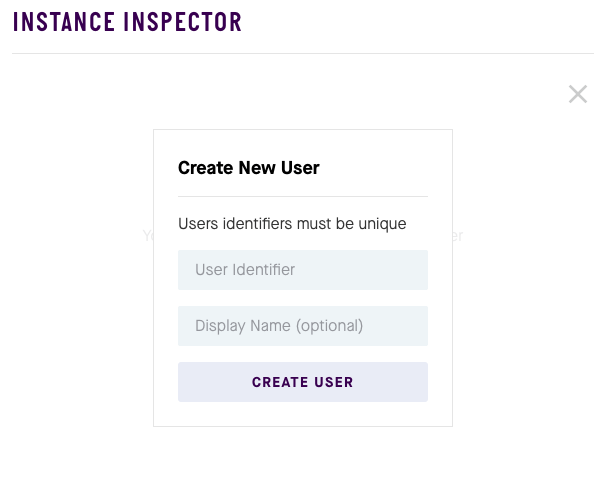 The Users screen is responsible for listing all the users that are currently online. This is where the user can select someone to chat with. They can also log out of the app from this screen. Next, render the chat UI. We’re wrapping everything in a KeyboardAvoidingView so that the entire chat UI will adjust upwards to avoid the keyboard UI while the user is typing their message. The Header shows the name of the user they’re chatting with, and a button to leave the chat room. 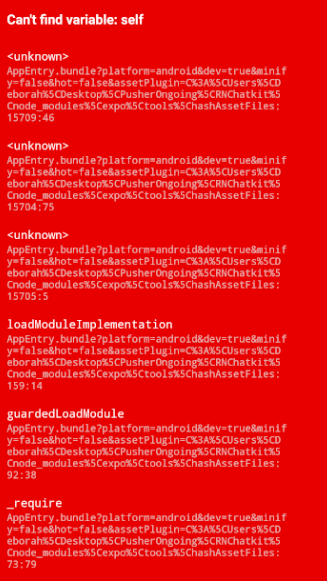 Again, all the chat-related data and functions are passed from the App.js file. // previously added styles here.. If you’re wondering what this.props.setScrollViewRef is, it’s the reference to the scroll view. In React Native, refs are usually used to manipulate a specific component. For a scroll view, a ref is usually used to programmatically scroll the scroll view to the bottom of the screen. And that’s exactly what we’re using it for: to scroll to the bottom of the screen when a new message arrives. This allows the user to easily view the latest message. Before we hook everything up in the App.js file, we first need to create the server. @pusher/chatkit-server - the Node.js SDK for Chatkit. This allows us to create new users for the Chatkit instance we created earlier. This happens when someone logs in to the app. The server creates a new user if the username used doesn’t already exist. body-parser - allows us to parse the request body when someone makes a login request. cors - enables CORS (Cross-Origin Resource Sharing) in the server so that requests coming from the app won’t get rejected. The app and the server doesn’t live in the same origin or host so requests get rejected by default if we don’t enable CORS. express - allows us to easily spin up an HTTP server and use middlewares such as cors and body-parser. Access http://localhost:3000 on your browser to test if the server is working. Now that you have added the UI for all the screens and started the server, all we have to do is hook everything up in the App.js file. As mentioned earlier, all the relevant app data and function is passed from the App.js file to each of the screens. This allows us to only have all the Chatkit-related initialization in a single file. In Chatkit, a single app instance can have many chat rooms. These chat rooms enable us to have a conversation between specific users only, instead of all the users who are currently logged in. The general chat room gives a space for us to determine the online status of all the users who are logged in (either online or idle/offline). 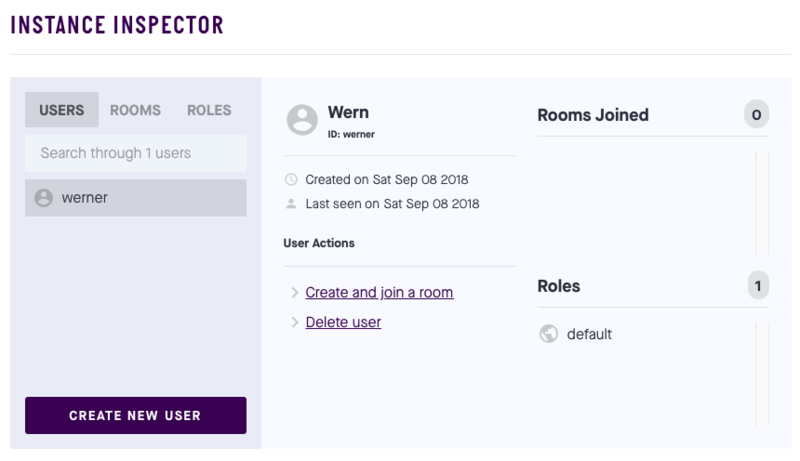 When a user logs in, they’re automatically assigned to the general room, that way, all the other users who have previously logged in can see if there’s a new user whom they can chat with. The general room is strictly for this purpose only, the users in that general room cannot actually chat with one another in a group chat fashion. The only thing they can do is select a logged in user from the list so they could chat with them. If you want to test the app with someone outside your home network, you can also use ngrok to expose the server, then use the https URL that ngrok is exposing instead. The following are the functions that we’re passing to the Login screen. Make a request to the server we created earlier to log the user in. Here, we use the fetch method to make a request. If we get either a 200 or 201 response from the server, the function that we passed inside then() will be executed. 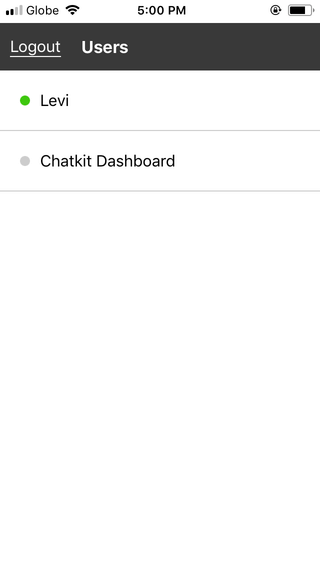 Next, we initialize a ChatManager instance and use it to connect the user to ChatKit. Once the user is connected, we subscribe to the general room. If you’re wondering what the difference between subscribing to a room and joining a room is, it’s is in how they work. Joining a room simply allows the user to join a room. This allows them to send a message to the room, that’s all. On the other hand, subscribing to a room implicitly joins the user the room while also allowing them to subscribe to certain hooks (for example, onNewMessage, onUserStartedTyping, onUserWentOffline) and execute a specific function when the hook is triggered by Chatkit. So if all you need is send messages, use the joinRoom method. 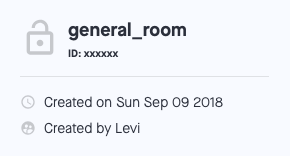 After subscribing to the general room, the Chatkit API returns all the relevant information of the general room. One of those info is contained in room.users which is used to get information about the users who have joined the general room. All we really need to get is their user ID, username, and online status. Once the variable containing the array of user objects is updated, we add it to the state and set the current screen to the Users screen. 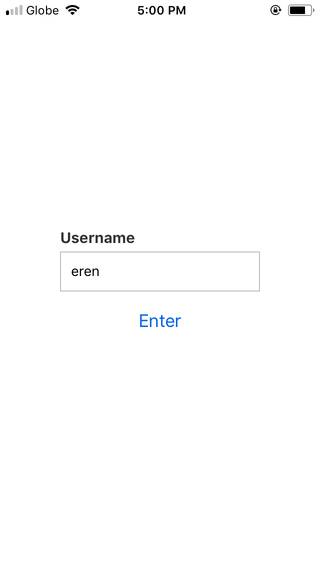 The room ID is constructed based on the username of the user you’re trying to chat with and your username. So if my name is “johnny”, and I’m trying to chat with a user named “bravo”, the room name would be bravo_johnny_room. The usernames are arranged alphabetically so it doesn’t matter who initiated the conversation, the room name would still be the same. Call the getJoinableRooms function. This allows us to fetch the rooms that the current user is able to join. Note that this doesn’t include rooms that the user is currently a member of. That’s why it’s important for a user to leave the chat room once they’re done chatting because getJoinableRooms won’t return that room since they’re still officially a member of that room. 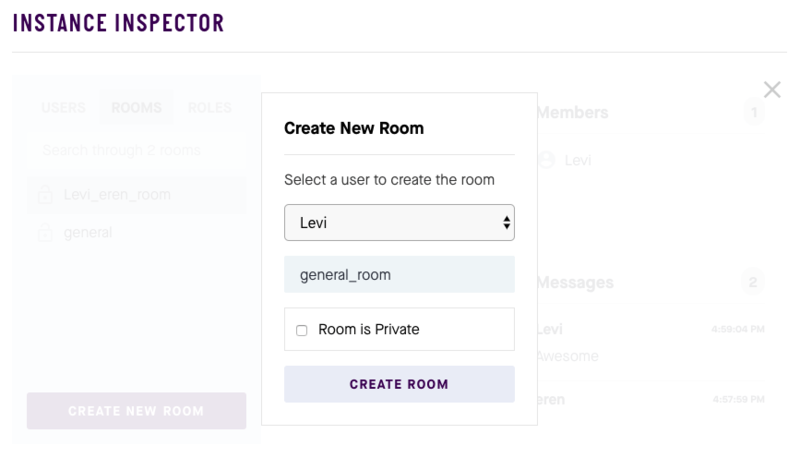 If a chat room that has the same name as the room name constructed in step one doesn’t exist in the joinable rooms, we create a new room with that room name. Once created, we call the subscribeToRoom function to add all the necessary subscription hooks. This is where another problem arises if a user didn’t explicitly leave a chat room. The problem is that the same room name is used, thus the user you previously chatted with in the room with the same name is actually using the old instance while you’re now using the new instance. And if that user also didn’t leave the room then a new room with the same name will also be created. The createRoom function doesn’t actually check if the room name you used is unique to that Chatkit app instance. If the chat room was found, we simply subscribe to the room. Get the ID of the oldest message. Chatkit only returns the five most recent messages sent in a specific chat room because we’ve set it when we subscribed to the room (see subscribeToRoom function). The first time the user pulls to refresh, we’re getting the oldest of these five most recent messages. Set refreshing to true so the user sees a loading animation while the app fetches the old messages. Once the messages are returned, we push the message data to the array of old messages. We can’t just directly push it to the array containing the messages because we’re working with old data, so we concatenate the old messages and messages. If you’re logged into your Expo account in the device where you installed Expo as well as the Expo CLI, it should automatically detect the most recent project you’re working with so all you have to do is select it. If not, you can also use the QR scanner in the Expo client app to get the project. Use Redux to maintain a general app state. In this tutorial, we had to pass a whole bunch of props to each of the screens and maintain them separately. By using Redux, we can remove a lot of boilerplate code and state updates all over the place. Use React Navigation to add routing capabilities to the app. In this app, we simply used the state to selectively show which screen we want to show. By using React Navigation, we can declare all the screens of the app in a single file and navigate to each of them using very simple code. Use the async-await pattern. In this app, we used a whole lot of promises and we often got really deep because of the conditions we had to check, and other requests we needed to make. By using the async-await pattern, we can avoid deeply-nested promise chains. Use the Gifted Chat component by Farid Safi. This component can really simplify the code for your chat app a lot. The component’s author has also written a tutorial about it in the Pusher tutorial hub: Build a Chat App with React Native and Gifted Chat. Add cursors and file attachment features to the app. These are the two other features that Chatkit allows you to implement. 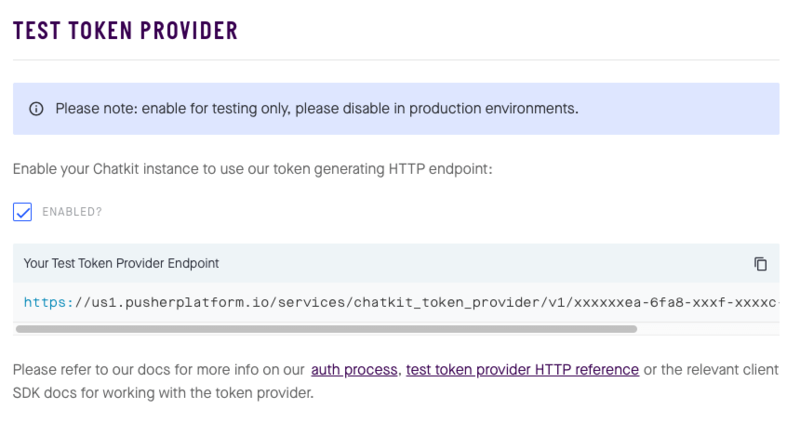 Add a /token route to the server for generating tokens to be used for making requests to Chatkit. This allows us to use Chatkit in production. Add a code to the server that will automatically kick a user out of the room if they’ve been idle for at least an hour. This should solve the issue that was mentioned earlier about users not leaving the room. That’s it! 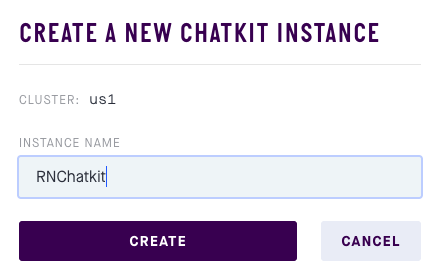 In this tutorial, you learned how Chatkit really makes it easy to implement common features that you’ll find in chat applications.